Waterjet cutting is a cold process, meaning that there are no heat affected zones, hardened material or material stresses created during the cutting process. A clean accurate burr-free finish often eliminates the need for secondary surface finishing. The process also leads to small diameter highly accurate Kerfs, ensuring that the clean finished products can be manufactured in a way that might not be possible with other processes. As well as being ideal for both short and long production runs, waterjet cutting enables prototypes for products still in development to be quickly and easily created, modified and refined where appropriate. Accurate and powerful for precision cutting of a wide range of materials and thicknesses. 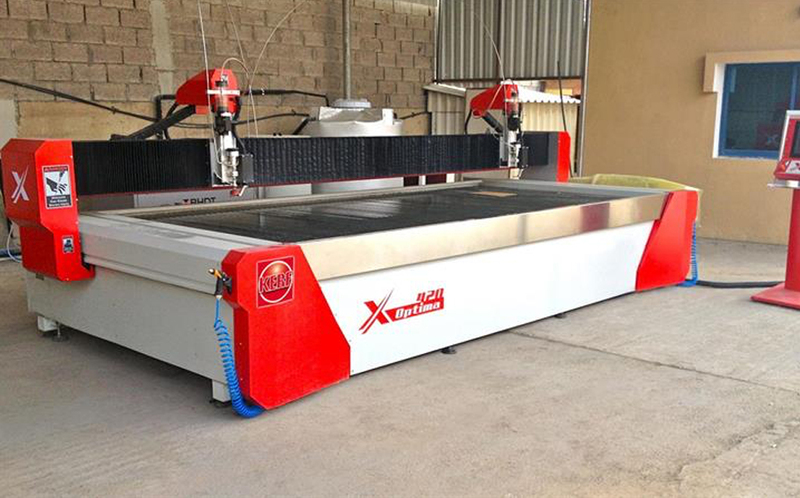 The Optima Waterjet Cutting Machine is a high-quality machine available in a wide range of sizes with three, four or five-axis capability. It is built using best in class elements and packaged up in turnkey solutions that include the machine, software, installation and training. The Optima can be built in a range of widths and lengths to suit your requirements. We can offer wide beams for applications with multiple heads or longer narrower machines where space may be an issue. We will select the most appropriate high-pressure pump for your application and control the system using advanced CADCAM software. We supply the machines with single or multiple cutting heads that have automatic height adjustment including anti-collision systems and offer a range of optional extra items such as dual cutting heads using a spacer bar, dual independent heads, a rotary tilting head and GRS abrasive removal systems. All machines supplied by Kerf are built to the highest engineering standards providing years of reliable operation. To find out more about our Optima Waterjet Range of profile cutting machines, please don't hesitate to get in touch for free advice, support, or technical knowledge.